April 6 is 'Doris Day Day' on MeTV Doris Day is getting her own day on Me-TV! In celebration of Doris Day turning 90 years old on April 3, Me-TV hereby proclaims Sunday, April 6, 2014, as 'Doris Day Day.' This milestone will be marked by a special four-hour presentation of 'The Doris Day Show' and features seven of Doris' favorite episodes. 'Doris Day Day' will feature interviews and birthday wishes from her co-stars and friends. Just a few of the celebrity co-stars that will be featured in this tribute to Doris include Kaye Ballard, Bernie Kopell, Tony Bennett, Lee Meriwether and Rose Marie. Robert Wagner and Betty White will also extend special birthday wishes to the honoree. 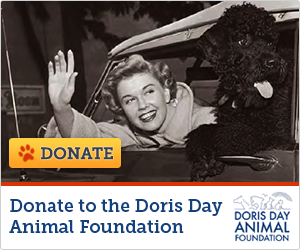 As part of the telecast, Me-TV will help raise awareness for Doris' organization, The Doris Day Animal Foundation, which she formed in 1978. The mission of her foundation is to protect the needs of animals, and to help provide them with care and homes. Me-TV will also give away copies of the new book "Doris Day’s Best Friends," featuring more than 200 photos of her life with animals. Proceeds from the sale of the book go toward the foundation. Please join Me-TV in wishing Doris a happy 90th birthday with 'The Doris Day Day' special on Sunday, April 6 from 3:00-7:00pm ET/PT. THE BUDDY - Mary Wickes, who appeared in four movies with Doris—'By The Light of The Silvery Moon,' 'On Moonlight Bay,'I'll See You In My Dreams,' 'It Happened to Jane'—guest stars as old Army major girlfriend of Doris' father, Buck, who runs the house with military might when Doris must leave. DORIS GETS A JOB - Doris meets McLean Stevenson's character and Rose Marie when she goes on a job audition in San Francisco. DORIS FINDS AN APARTMENT - Doris finds a San Francisco apartment over Italian restaurant owned by Kaye Ballard and Bernie Kopell. TONY BENNETT IS EATING HERE - Word travels fast when Tony eats at Pallucci's restaurant. Bennett also sings with Doris. DORIS GOES TO HOLLYWOOD - Doris' sons enter her in a Doris Day look-alike contest, and she wins trip to Hollywood. Henry Fonda cameos. HOSPITAL BENEFIT - Doris puts on her most exotic fashion show ever to aid boyfriend Peter Lawford. Lee Meriwether guest stars. IT'S A DOG'S LIFE - In the last show filmed for the series, Doris tries to save dogs from the dog catcher and Billy DeWolf's character, Mr. Jarvis, shows his love for dogs as does John Dehner. Two of Doris' dogs appear in episode.